Madrid is a fantastic city, full of life, food, and culture. Whereas most people in the world end up adoring Barcelona, I ended up head over heels for Madrid. Even in the peak season in Madrid, the tourists feel dispersed (as long as you’re not waiting in line for the Prado, but that’s another story…) and prices are reasonable. 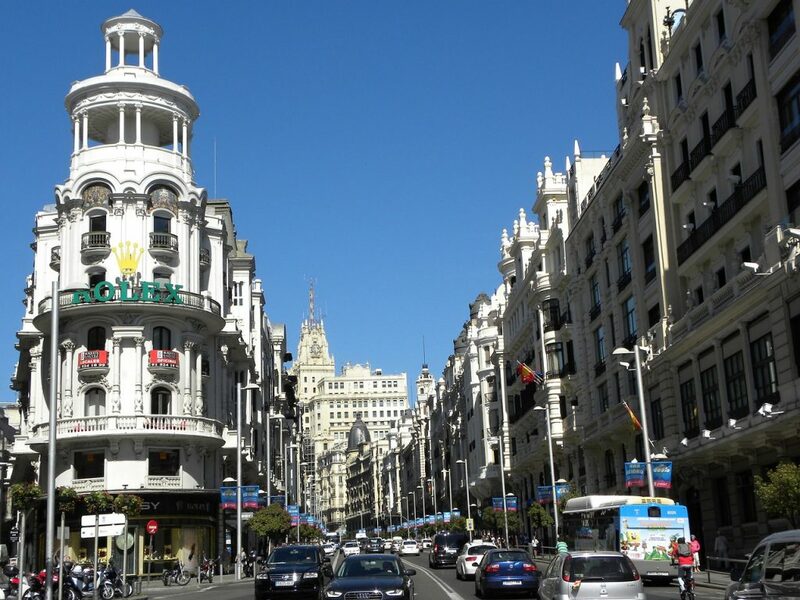 The backbone of any good Madrid itinerary is picking a central and fantastic neighborhood. Since you only have 2 days in Madrid, you’re going to want to stay somewhere central. If you’re trying to decide what neighborhood in Madrid to stay in, here’s my personal choice: Puerta del Sol. 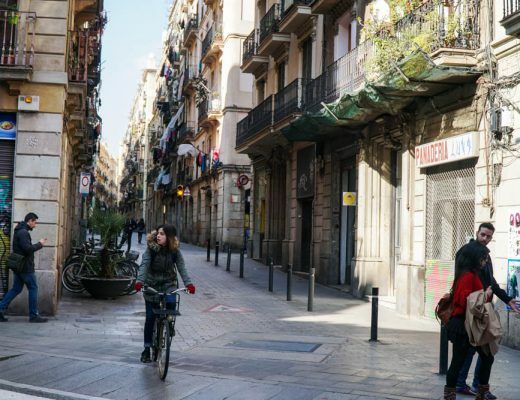 This neighborhood is the heart and soul of Madrid, and our Airbnb was right in the thick of it. We took full advantage of our prime situation and dove into the Spanish style of life – eating, snacking, drinking, repeat. Oh, and I guess a bit of tourism squeezed in between bites of luxurious ham and gulps of fantastic rioja. Puerta del Sol is the neighborhood I recommend you stay in if you have only a short amount of time like 2 days in Madrid. But in case you’re staying elsewhere in the city, make your way over to Puerta del Sol to start your Madrid itinerary here. 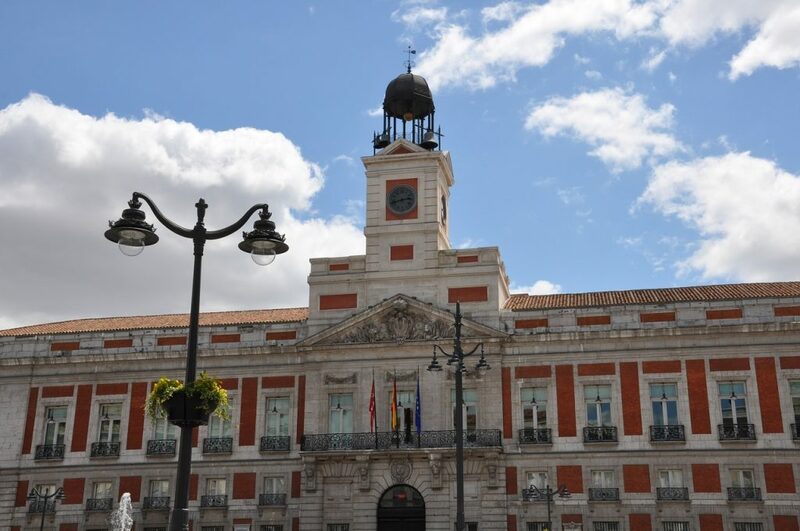 This is one of the busiest and best-known squares in Madrid, and quite literally the center of the city, as all the main roads radiate outwards from this central point. There are a few important points in Puerta del Sol: the Real Casa de Correos, an old post office that is now home to the President of Madrid’s Autonomous Community, the Kilometer 0 stone, the “Bear and the Strawberry Tree” statue, and the giant Tio Pepe advertisement that’s now part of Puerta del Sol’s skyline. Do I seem a bit ridiculous suggesting you start your 2 days in Madrid by shoving your face with ham? I’m sorry, but I simply must. Museo de Jamón (Calle Mayor, 7) is truly a pork lovers’ dream, literally packed wall to wall with enormous cuts of ham in every shape and size. And it’s cheap. As in, I wonder how they even turn a profit cheap. We got a heaping plate of four different kinds of ham and manchego cheese for less than 8 euros. A beer? 90 cents (and that’s not even the small caña size, which will only set you back 50 cents) AND it comes with a snack. 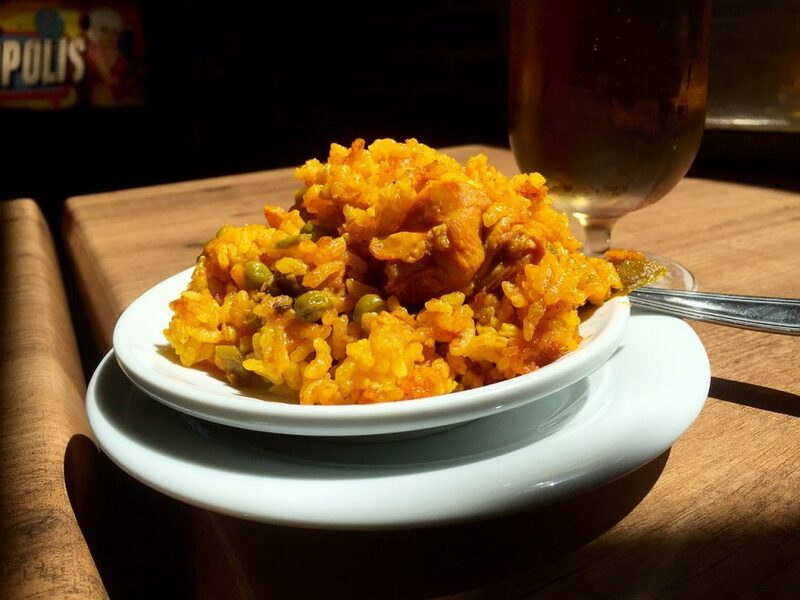 While you could skip the caña of beer since it is technically breakfast, I say screw it – if you only have two days in Madrid, you may as well live them to the fullest. I loved Museo del Jámon so much that I went twice: once at night during the Madrid Pride festivities, when it was jam packed with drunken revelers taking a wise break to refuel before returning to the debauchery. We loved it so much we went back again less than 12 hours later for breakfast, where we each had an espresso and a croissant, ham, and cheese sandwich for less than 3 euros apiece. 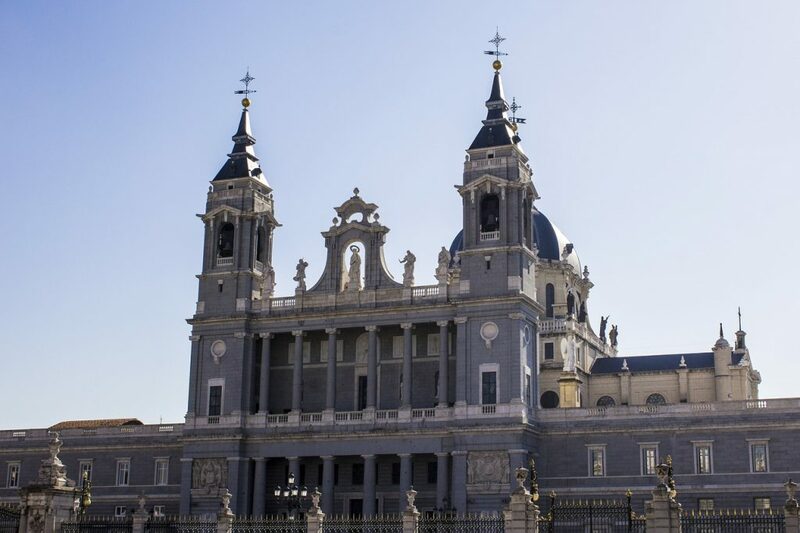 Just a short walk from the Royal Palace, you can’t miss the gorgeous Almudena Cathedral in the Madrid skyline. Although this cathedral is considered young and relatively new, its beautiful look today belies a history of more than a century of problematic construction. You see, Francisco de Cubas originally wanted to construct a pantheon to honor the late Queen Maria in the second half of the 19th century, influenced by 18th century French Gothic design. Even though the first stone was laid in 1879, following religious developments, the plans changed for the structure that was planned to be a pantheon to be a cathedral instead. Its crypts opened in 1911, but they were shut down because of the civil war that came on as a result of the Franco fascist regime. Decades after, it ran at a smaller capacity, until it was redesigned and then fully finished in 1993. While it may be a new building in a city filled with older architecture, I still think it’s worth visiting for its interesting history and gorgeous look that blends into the more jam-packed Madrid cityscape in a beautiful fashion. Now, pretend you didn’t just shove your face full of ham and beer at my behest and get some culture at the lovely Royal Palace, one of the most important places in all of Madrid (and Spain in general). Madrid has stood long before it became the capital of Spain. Its original name was Magerit. The spot where the city’s fortress once stood is now where the Royal Palace stands today. Because the old fort burned down, King Philip V ordered a new palace to be built. It was inspired by the Louvre and as a result of that inspiration, it also has sprawling grounds, gardens, and fountains. The palace has over 3,000 rooms, which include the Main Staircase, Throne Room, the Guards Room, and many more. 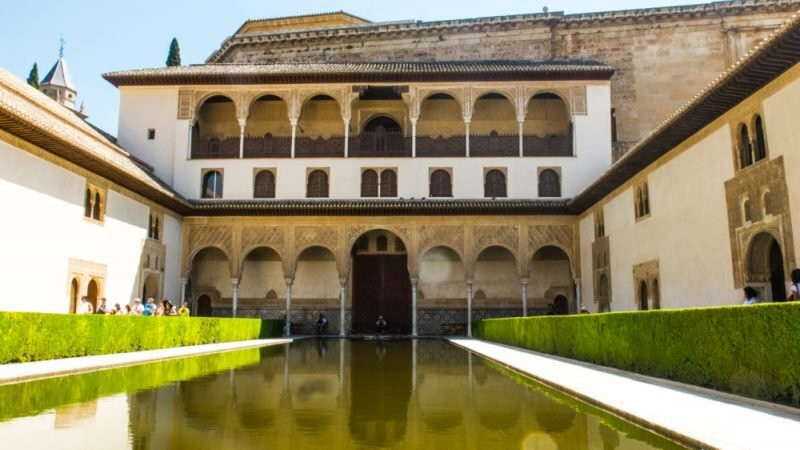 It’s one of the most visited historic buildings in Spain, and for a very good reason! 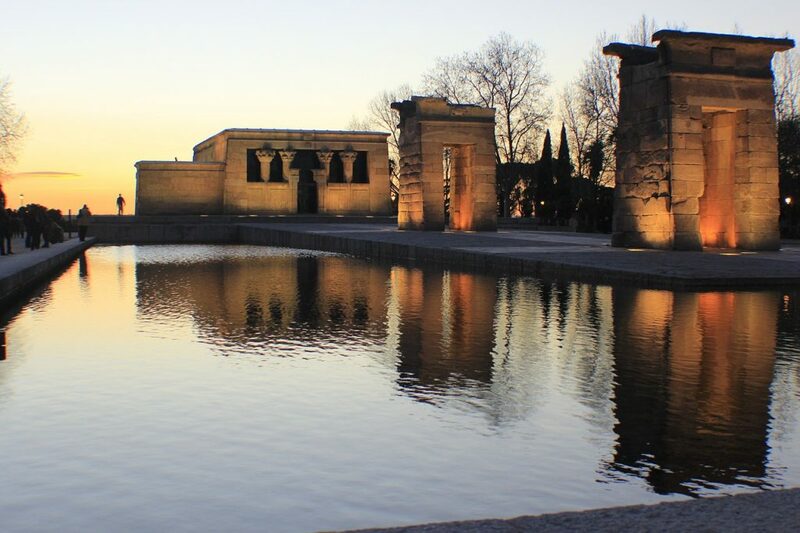 The Temple of Debod is a true piece of Egyptian history in the heart of Madrid. However, unlike most Egyptian artifacts you can find in the West (cough British Museum cough), this temple was actually a gift from Egypt to the city of Madrid! It was originally constructed in the 2nd century BC, by the orders of the Meroe King of Egypt. The temple was dedicated to the god Amun and goddess Isis, with gorgeous high reliefs carved into the stone. Egypt gifted this temple to Madrid in the 20th century to protect the city of floods. It was disassembled from its original location and then rebuilt stone by stone when everything was transported. The temple opened to the public in 1972 and it’s been one of Cuartel de la Montaña’s biggest attractions ever since. 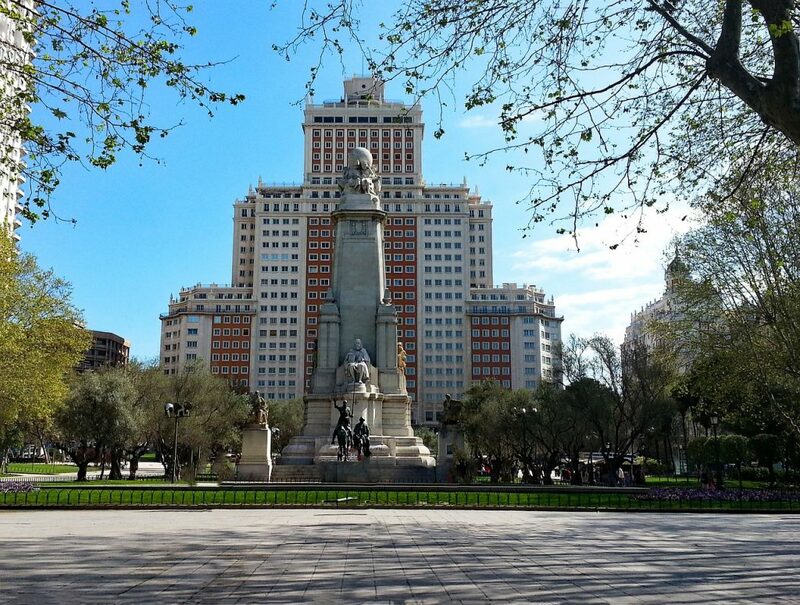 With its massive monument to the legendary author Miguel de Cervantes, the author of Don Quixote, it’s hard to miss Plaza de España on your walk back towards Puerta del Sol, where your lunch stop is. Near the Plaza, there are a few quick points of interest to note. First is one of the tallest buildings in the city, Torre de Madrid at 142 meters/466 feet tall, and Edificio España at 117 meters/384 feet. Combined with the statue of Miguel de Cervantes, it’s one of the most iconic photos of Madrid. Another interesting building to note is the gorgeous House of Gallardo, dating back to 1911 and emblematic of the strong Art Nouveau movement that took place in Madrid around the turn of the century. The covered marketplace of Mercado San Miguel is a great introduction to tapas. My favorite eats there were the sweet and savory toasts piled high with mozzarella or burrata, the olive and pickled vegetable skewers called bandarillas, and some delicious vermouth with orange and ice for a single euro fifty. Olives, check. Pickled peppers, check. Self-control, not pictured. 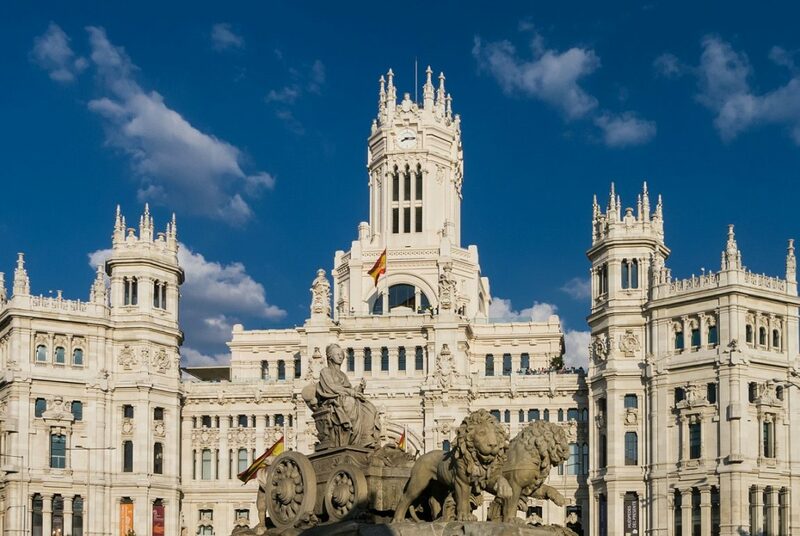 Don’t eat too much here, though – this Madrid itinerary has you scheduled for a dinner walking tour exploring the tapas scene of this city at 7 PM, so you’ll want to save your appetite for later. One of my favorite neighborhoods in Madrid is La Latina. The Basílica de San Francisco El Grande is one can’t-miss place in La Latina, and it provides an interesting contrast to the newness of the Almudena Cathedral near the Royal Palace. 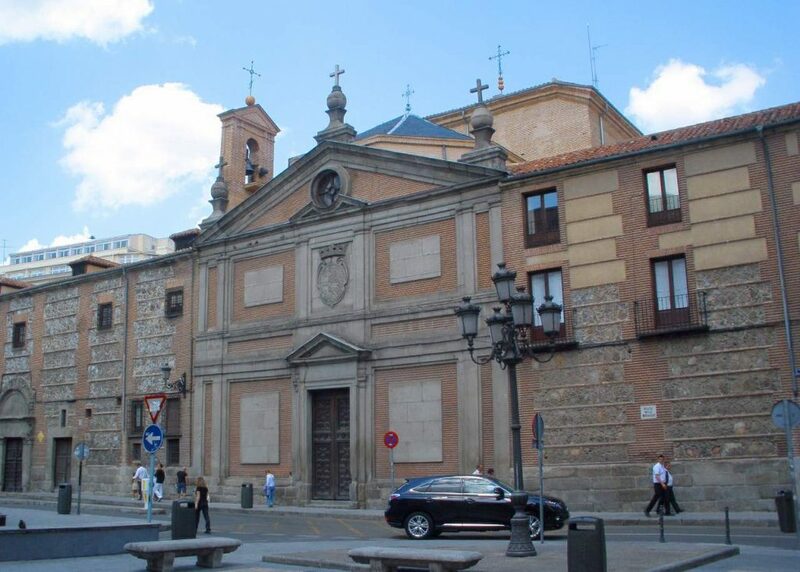 Dating back to 1760, the church is one of five Royal Basilicas of Madrid and has three chapels, including a beautiful painting by the famous Spanish artist Francisco De Goya. 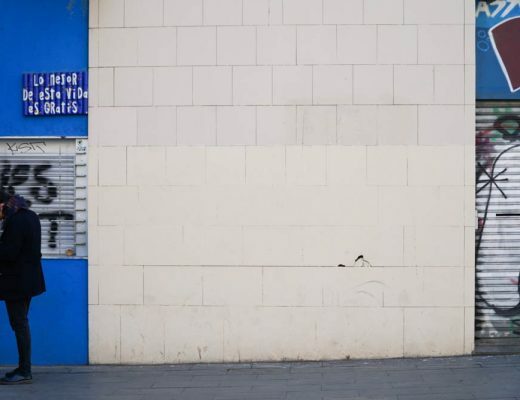 Another interesting part of La Latina is the Mercado de la Cebada, which has become a major street art hub in Madrid. Both inside and on its outer walls, you’ll find countless murals featuring street art by a variety of different artists both Spanish and foreign. If you happen to be in La Latina on a Sunday, you shouldn’t miss El Rastro flea market, the largest open air market in all of Madrid. While a bit touristy, it’s great fun to browse and see if you can find something worth the treasure hunt. 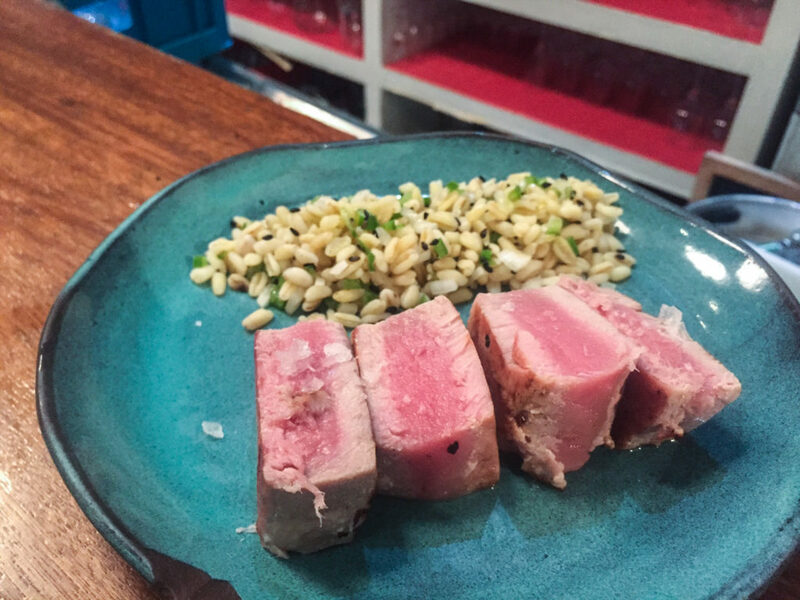 One of the best things to do in Madrid is mixing up delicious food and awesome history! 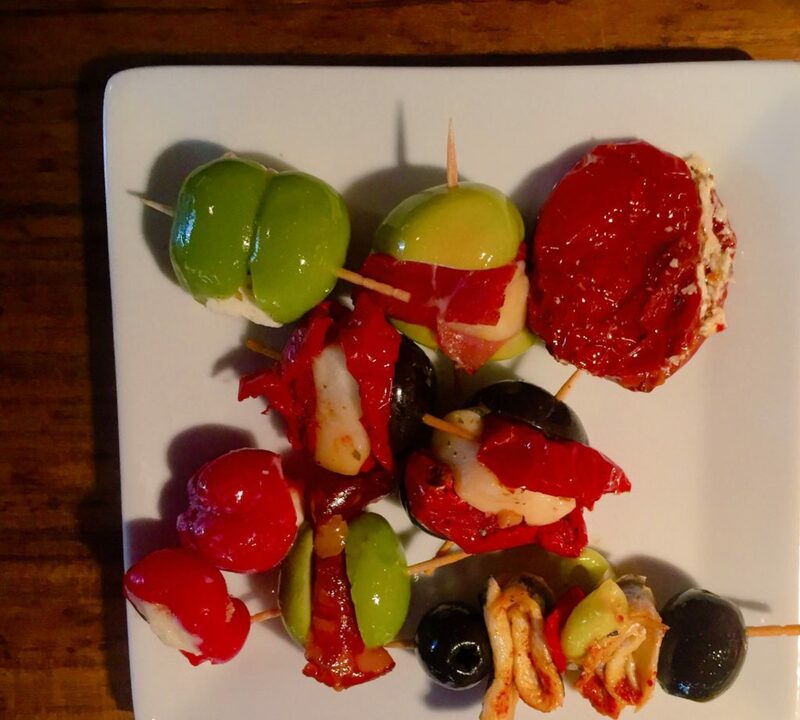 Going for a tapas walking tour means the best of both worlds: you’ll discover old monuments and historic buildings from your guide’s local knowledge while stopping at 4 to 5 different tapas restaurants to try all the best food in Madrid along the way. 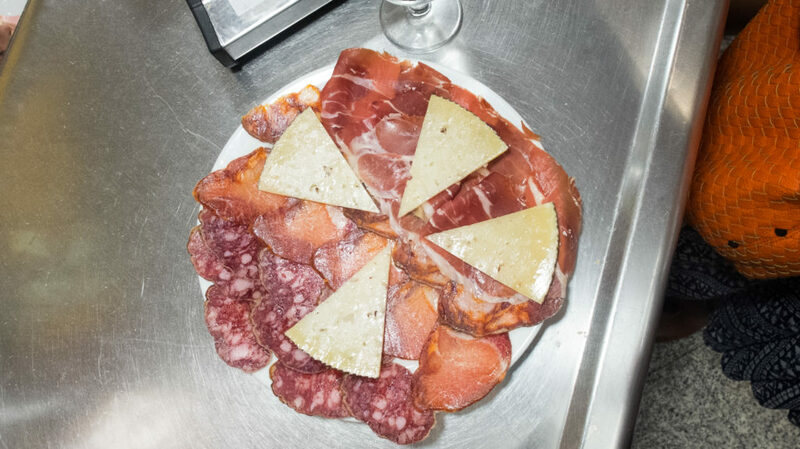 Tapas tastes include Iberian ham (aka the world famous jamón iberico), seafood paella, local Spanish cheeses, and several other surprises as well as a selection of red or white Spanish wine, beer, or soft drinks. For more information, check out tour details here. Yesterday it was ham for breakfast, now it’s churros! There are many places churning delicious churros con chocolate all over Madrid, but the oldest and most famous is Chocolatería San Ginés. 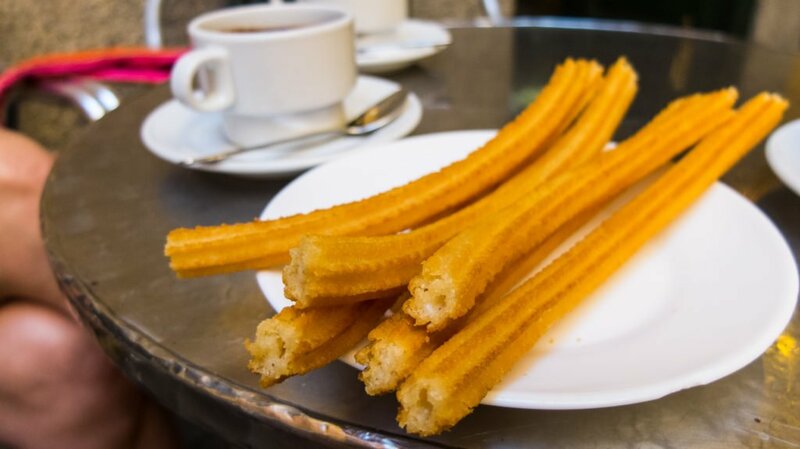 The churros here are perfectly fried – crunchy on the outside, soft inside, without any taste of grease. Unlike their Mexican counterparts, these are not rolled in sugar and cinnamon; instead, you drown each bite in the cup of warm chocolate sauce. Pair with an espresso and you’ve got one hell of a sugar and caffeine rush – ready to take on day two of your Madrid itinerary. Visiting Madrid without visiting the Prado is like going to London and not seeing Tower Bridge or Paris and not seeing the Eiffel Tower. Simply foolish, in my opinion. However – the line at the Prado is one of the most insane lines that I’ve seen. I recommend booking a skip the line ticket and putting it at the beginning of your itinerary on day two in order to minimize the crowds that pack the museum after lunch. Simply book it online and present on your mobile (no need to print). 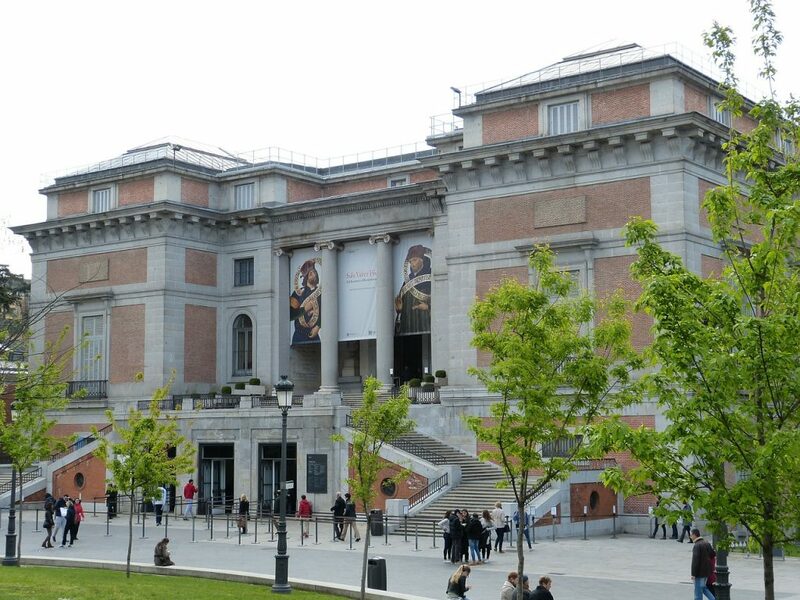 Considered one of the most prestigious museums in Spain, Museo del Prado boasts one of the largest art collections in the country. It’s one of the most visited tourist attractions mainly because its walls are lined with artistic masterpieces the likes of which are hard to find a worthwhile comparison to. It’s on par with the Louvre or the Met in terms of vastness and quality of art. The Prado has over 8,000 paintings and over 700 sculptures in its possession, which come from different schools of art ranging from the 12th to the 20th century. Here you’ll find masterpieces like Velasquez’ Las Meninas and Goya’s Third of May. The Prado holds the largest collection of Spanish art in the world, and one of the best collections of European art in general. It’s a can’t-miss for any art fan. 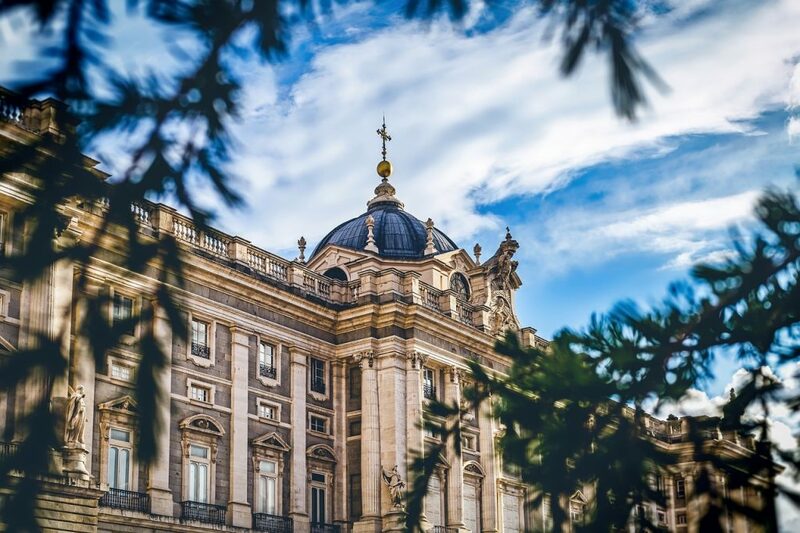 Madrid’s take on Central Park, walking through the scenic Retiro Park with its manmade lake and Crystal Palace is an unmissable part of any Madrid itinerary. 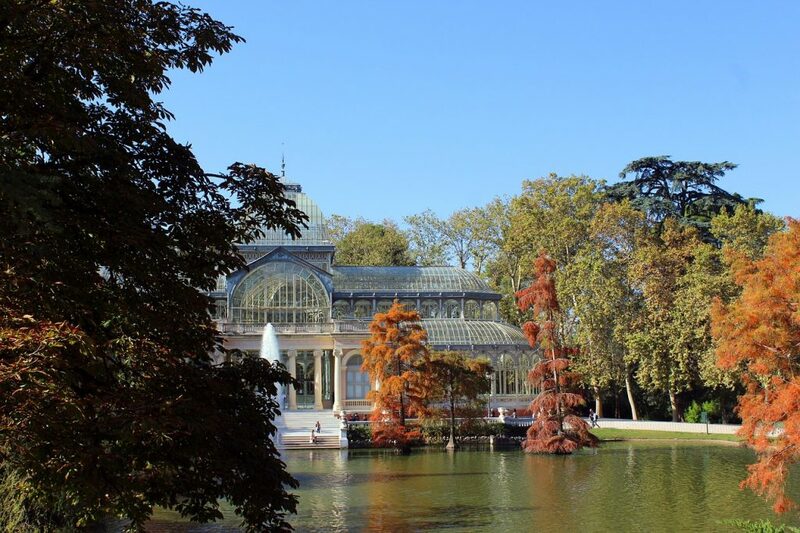 Located in the heart of Madrid, El Retiro Park is the city’s green lung. It spans over 120 acres and includes dozens of thousands of trees. It’s one of the most popular recreational areas in the city. Here you’ll find several different gardens, each comprised of beautiful types of flowers. The park even has a centuries-old Mexican conifer, which is supposedly Madrid’s oldest tree. The biggest highlight of the park is the Large Lake. You can rent a boat to take out onto the lake (the perfect place for selfies!) for 6 euros on weekdays and 8 euros on weekends. Make sure to visit the exhibitions at the Velasquez Palace and the Crystal Palace, made almost entirely of glass and a can’t-miss Instagram spot in Retiro Park. Madrid’s answer to Paris’ Champs-Elysees and NYC’s Broadway all rolled into one street, this is the hub of shopping and entertainment in the city. Strolling down this grand avenue is one of the best ways to take the pulse of the city of Madrid, and it’s electric any time of day or night. Don’t miss the massive Telefónica Building, built in 1928 and an early example of the skyscraper craze that would later change the definition of city skylines worldwide. There are also several cinemas, bars, and restaurants on this street, so I recommend stopping for lunch somewhere along the way. I recommend De María Gran Vía or La Sirena Verde, located at 72 and 62 Calle Gran Via respectively. Literally translated to the Monastery of Barefoot Royals, this monastery a few short blocks away from Gran Via is definitely worth a small detour. Dating back to the 1500s, this monastery has an interesting and fascinating history. While many monasteries and convents are a bit austere, where the monks or nuns live in rather spartan conditions, this monastery is incredibly ornate. The reason for this is that the convent was primarily for young widowed women or noblewomen who never married — and therefore, for their dowries as well. 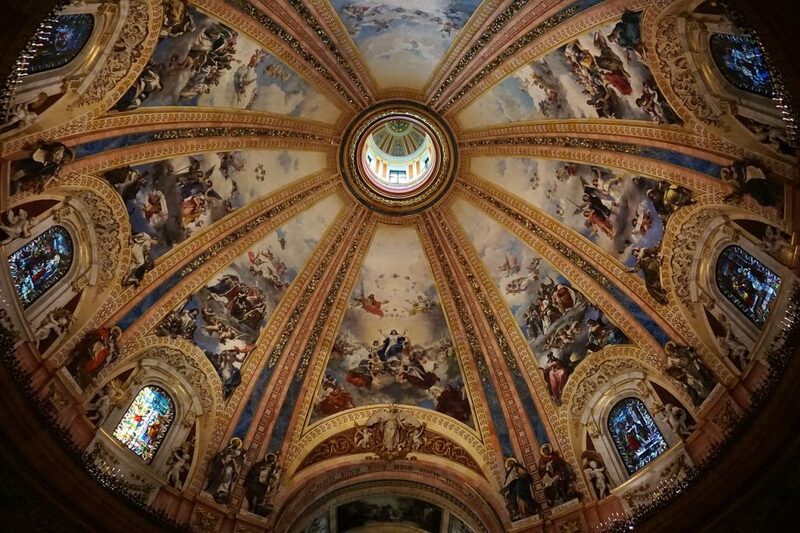 The convent quickly became one of the richest convents in Europe, and you can see the splendor in the paintings and wall hangings that decorate the monastery to this day. By the 20th century, the population of who lived in the convent changed dramatically, and rather than housing impossible-to-marry-off noblewomen, it ended up hosting primarily impoverished women. In the 1960s it became the museum that it is today. The monastery is open daily from 10 AM to 2 PM and then again from 4 PM to 6:30 PM (except on Sundays, when it’s open from 10 AM to 3 PM), so be careful if you are visiting around lunch time. One of the things you shouldn’t miss when in Madrid is the opportunity to simply people watch. There are countless cafés in the area around the monastery and Gran Via. The monastery is quite close to the Torres Barmejas where the flamenco show is, so I recommend not straying too far from this area. 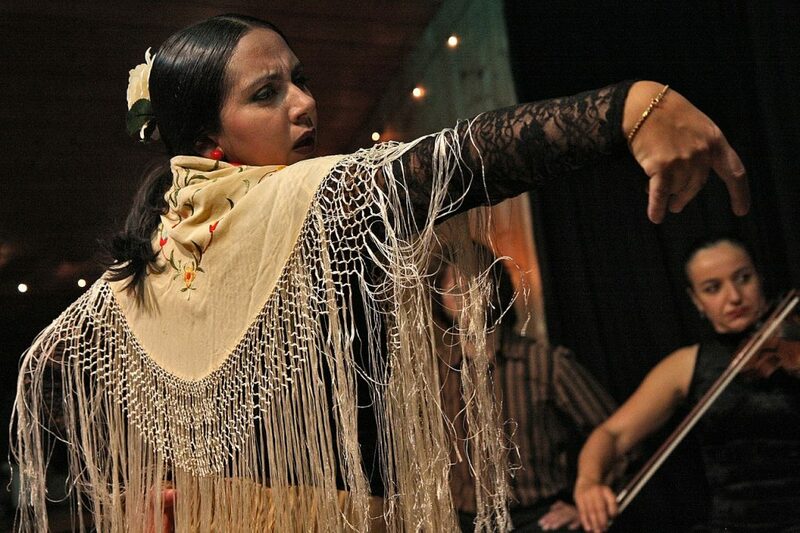 Flamenco is one of the most popular pieces of folklore and a truly unmissable Spanish experience. It’s an energetic and passionate dance and has its roots deep in Spanish history and culture. There are countless venues where you can watch a flamenco show, but one of the most highly-rated in the city is the nightly 7 PM show at Torres Barmejas near the Gran Via of Madrid. The decors and motifs are a wonder to look at, inspired by the gorgeous Andalusian city of Granada and its majestic Alhambra Palace. The Spanish Moorish motifs and décor really add to the captivating atmosphere of the performance. The choreography and energy of the flamenco dance, including interesting finger and hand gestures, is one of the most unique aspects of the Spanish culture. You can order dinner here, but in my opinion, it’s overpriced and not high quality enough to justify the expense – especially considering the plethora of amazing restaurants and tapas bars surrounding the venue. So, just order drinks or just take in the show and save your appetite for later. The show at Torres Barmejas is quite popular and often sells out, so I highly recommend booking your tickets in advance to be sure to see one of the best flamenco shows in Madrid. A good 75% of the reason why I decided I needed a month in Spain was to eat my way through all of the delicious tapas the country has to offer (the other 25% is wine and cider, obviously). I got a good head start on my goal in Puerta del Sol, where we ate at a few delicious restaurants. Lambuzo had delicious tapas and some great wine. As a huge Spanish wine fan, I went for the Ribera del Duero – so tasty! We loved the berenjas (fried eggplant with a dark, rich honey sauce), atún rojo (perfectly rare ahi tuna), and the croquetas de gambas (fried potato and shrimp croquettes). My other favorite spot for dinner is La Carboneria. While it is in a touristic area, the food quality is so excellent that I literally ate there twice during my time in Madrid. What can I say – I was just that obsessed with their albóndigas a la casera (meatballs home-style – though I need to figure out who’s home it’s styled after and how I can move myself in there ASAP). They also have the most perfectly cooked tortilla española I’ve had the pleasure of putting in my mouth. It was simplicity at its finest, a perfectly melting synthesis of potato and egg. It was gooey in the best way – not dry and set like less fresh tortilla españolas can be. Don’t forget to order their delicious sangria! Truer words have never been spoken. 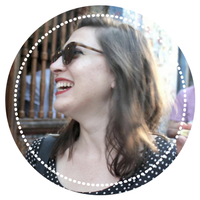 I am obsessed with Madrid’s food and want to go back there specifically to eat my way through the city. I think you will definitely have time with 4 days even if you like to take it easy when you travel! I clustered the sites together to make it easy to visit in 2 days so 4 is definitely do-able!